Today at Bayou Teche Brewing’s Brewery and on site Tap Room and Beer Garden near the banks of the Bayou Teche, innovative ales and lagers are being crafted true to the brewers’ original intent – beers that complement the unique foods and lifestyles of South Louisiana. A full list noted below or on the Bayout Teche website. The original brew house has served them well for a number of years but now with an ever growing range of beers using a wide range of ingredients instead of the usual malt, water and hops a new automated modular brewhouse was required. 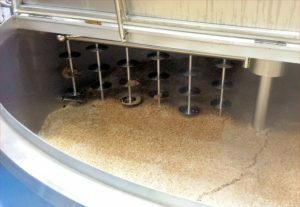 Typical ingredients used by the brewery include, raw cane sugar, barley, rice, wheat and rye malt which can be a challenge for some filtration systems…. There were several key factors in the choice of brewhouse supplier one of which was modularity and flexibility. 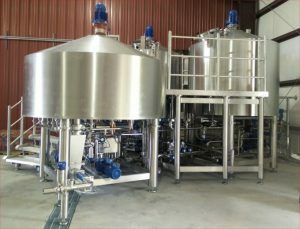 To achieve this a new brewhouse was ordered from Simatec Srl in Italy. Simatec as well as building brewhouses also have the added advantage of being brewers in their own right resulting in a perfect partnership of brewing and manufacturing excellence. Their award winning brewery “SorAlaMA” in Turin, Italy produces beers from berries, nuts as well as Pils etc all of which has given Simatec a great deal of experience in making flexible equipment for the brewer. A 24 hl brew house was installed capable of automatically producing up to 6 batches per day in phase 1. As the business continues to grow and demand increases for their great beers a further two vessels can be added that will allow up to 13 brews per day to be produced – automatically and with only two transfers of each batch thus reducing hot oxidation and increasing shelf life. This ensures future proofing of the production and means as so often happens that in years to come they will not need to replace their plant with all the disruption this can cause. Recipe Design – Set your numbers and you’re done. It does give you many parameters to adjust; 7 mash rests, 5 hop additions, any temperature control you can think of. Our 12 Plato Lager came out at 11.9 and unless I change a parameter it will always come out the same. Steam – This is not an all or nothing system. I’ve never seen the actual mash temperature venture more than +-0.3 degrees Fahrenheit. In addition you can tell it to go from step to step in degrees per minute. I’ve been toying with a lot of protein rests as a result. So I’m not just getting an alpha rest here and a beta rest there. I’m getting the whole spectrum in between, as fast or as slow as I’d like. And of course the consistency from batch to batch. Multi Functional Tanks – To me the best thing about these is that now I can decoct and cereal mash. The paddles are awesome. they stay on for the duration of both the mash and the boil, so no hot spots. It allows you to mash very thin to increase efficiency and have more control over final gravity. I’ve been able to get our corn lager down to 0.8 Plato from 12, something I could have otherwise not achieved. The vent stack is narrow and allows for a hotter boil. we typically boil at 214 and since those paddles are always turning, there’s just not a hot spot. We use pilsner malt so the hotter boil has allowed me to drive off DMS in 60 minutes rather than the traditional 90. Lastly our hot break has improved because those large chunks of protein are not being chopped up at the whirlpool due to being sucked up by a pump. Instead the paddles whirlpool. Manual Mode – This is where things really get fun. While I think what Simatec has achieved in automation is second to none, I really like the fact that you can Pause, run Semi-Automatically, or just run the thing Manually. This is where decoction and cereal mashing come in. Is there a program to decoct? No. Does that prevent you from doing it? Absolutely not. To decoct: write your recipe, mash in, go into Manual Mode, transfer however much mash you want from one multi-function tank to another, boil, transfer back, go back into automatic and it will pick up right where you left off. Want to cereal mash? Before you start, put in Manual Mode, transfer hot liquor to you tank, throw the grain of your choice in (this is Louisiana so for us it is rice), rest, boil, and start your mash in (you probably want to compensate for the near boiling porridge in the tank. The point is that you can do a lot more than just press start. Simatec Srl of Turin work with Enterprise Tondelli for the UK market and have a number of installations already in the UK. 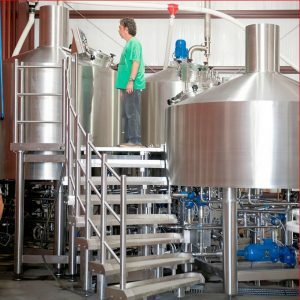 The range of brew houses is from 3 hl to 96 hl brewhouse – always with an expandable or modular approach. As part of their production they also supply all types of vessel, hot/ cold liquor tanks, chilling plant, steam raising etc to give a turnkey brewhouse solution. Inovation includes the isobaric hop injector that reduces dry hop consumption and saves money and time…..
Enterprise Tondelli based in the UK and Italy supply bottling, canning, kegging and packaging lines to the beverage industries as well as brew houses to give a turnkey solution for your project. 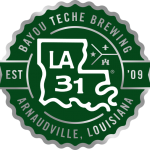 Where Buy Bayou Teche Brews? LA 31 Acadie crafted with malts from European farms, German Saphir hops, and raw Louisiana cane sugar. Pairs well with Camembert, Brie, Chevre, Fried Seafood Platter, Chicken and Sausage Jambalaya, Shrimp Po-Boy, Tasso and Asparagus Crepe. Ragin’ CajunsTM Genuine Louisiana Ale embraces locally grown grain in its recipe for a flavourful lighter-bodied, dry, crisp, and snappy craft ale. This Kölsch-style ale is brewed with barley, rice and multiple additions of German-grown, noble hops to produce a magnificent balance of hop bitterness, taste and aroma. LA 31 Bière Noire is a dark French Saison featuring specially roasted dark malt with chocolate notes, fine European barley and wheat, and select noble hops that lend a small bite of bitterness and a dry, French-roasted coffee flavour- 20 IBU and 5.4% ABV. Enjoy it with grilled steaks, hamburgers, or sausage po-boys, any spicy blackened Cajun dish. Pairs well with Manchego, Blackened Red-Fish, Raw Oysters, Sausage Po-Boys, Grilled Burgers. Saison D’Ecrevisses (Crawfish Season is brewed to complement the spicy epitome of Cajun cuisine. Saison D’Ecrevisses (Crawfish Season) is a Belgian-style Saison spiked with a generous amount of rye malt and then fermented with a distinctive Belgian yeast that gives this beer its dry and peppery finish. Finished with imported French Aramis hops, Saison D’Ecrevisses has 21 IBUs and is 6% ABV. Pairs well with boiled crawfish and seafood.